Summary: Eagle syndrome is an aggregate of symptoms caused by an elongated ossified styloid process, the cause of which remains unclear. This is a rare finding that often goes undetected in the absence of radiographic studies. In this case, we present the diagnostic CT and lateral view plain film radiography findings of a 39-year-old woman with clinical evidence of Eagle syndrome. Eagle syndrome can occur unilaterally or bilaterally and most frequently results in symptoms of dysphagia, headache, pain on rotation of the neck, pain on extension of the tongue, change in voice, and a sensation of hypersalivation (1, 2). We present rare and diagnostic radiographic evidence of this on both plain film radiographs and CT scans. Although well documented in otolaryngology literature and dentistry literature, this syndrome has not been reported in the radiology literature. A 39-year-old woman presented at the Otolaryngology Clinic complaining of dysphagia and vague throat discomfort that she had experienced continuously for slightly more than a year. She also complained of occasional “shooting” pains to her left ear that lasted only a couple of minutes and then disappeared. Her history was uneventful for any significant trauma, but she did recall that she had undergone a tonsillectomy approximately 7 years previously. During the physical examination, a solid mass was felt on palpation of the left tonsillar fossa, and radiographic studies were ordered. Lateral view plain film radiographs showed an elongated ossified styloid process, with the left larger than the right (Fig 1). CT provides complimentary information to that of plain radiography, including definition of the relationship of calcifications to surrounding neck soft tissue structures in the axial plane (Fig 2). On the left, the thick calcified process extended from the stylomastoid foramen to the hyoid bone. The patient underwent surgical removal of a 4.7-cm styloid bone through an external approach. Surgery and hospital stay were uneventful, and there was no compression of surrounding nerves. The patient remained symptom free 9 months after surgery. Eagle syndrome is an aggregate of symptoms that includes recurrent throat pain, foreign body sensation, dysphagia, and/or facial pain as a direct result of an elongated styloid process or calcified stylohyoid ligament (3). Although approximately 4% of the population is thought to have an elongated styloid process, only a small percentage (between 4% and 10.3%) of this group is thought to actually be symptomatic (4). No data could be found to correlate degree of elongation of the styloid to severity of symptoms. Diagnosis is made both radiographically and by physical examination. Palpation of the styloid process in the tonsillar fossa is indicative of elongated styloid in that processes of normal length are not normally palpable. Palpation of the tip of the styloid should exacerbate existing symptoms (4). If highly suspicious for Eagle syndrome, confirmation can be made by radiographic studies (4). Most frequently, a panoramic radiograph is used to determine whether the styloid process is elongated. In reviewing these radiographs, it should be noted that the normal length of the styloid in an adult is approximately 2.5 cm (5) whereas an elongated styloid is generally >3 cm in length (6). Although Eagle syndrome is thought to be caused by an elongated styloid process or calcified stylohyoid ligament, the presence of an elongated styloid process is not pathognomonic for Eagle syndrome because many patients with incidental findings of an elongated styloid process are asymptomatic. Lateral view radiographs of the skull can be substituted for panoramic radiographs (as in this case), and an anteroposterior view radiograph should be obtained to determine whether there is any lateral deviation of the styloid. As stated earlier, CT is useful in that it provides complementary information to that provided by plain radiographic studies. The actual cause of the elongation is a poorly understood process. 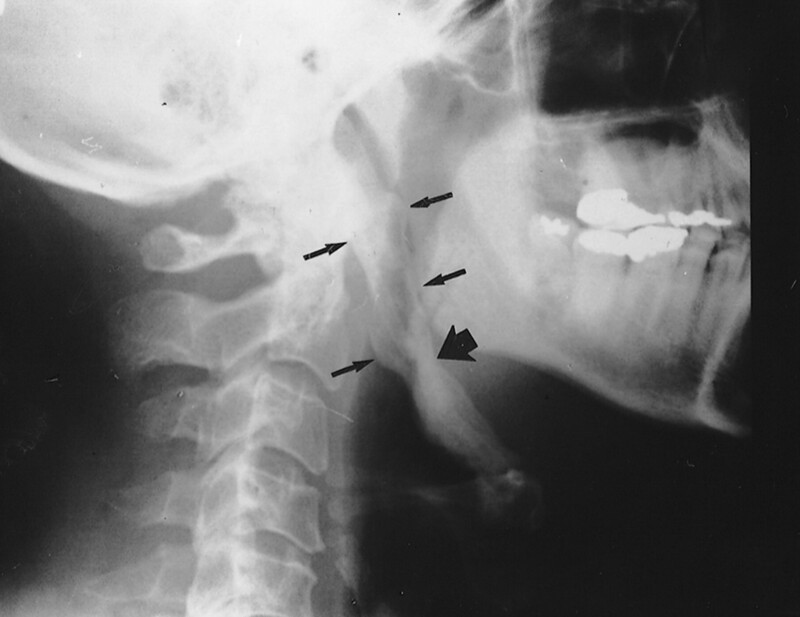 Several theories have been proposed: 1) congenital elongation of the styloid process due to persistence of a cartilaginous analog of the stylohyal (one of the embryologic precursors of the styloid), 2) calcification of the stylohyoid ligament by an unknown process, and 3) growth of osseous tissue at the insertion of the stylohyoid ligament (3). The pathophysiological mechanism of symptoms is debated as well. Theories include the following: 1) traumatic fracture of the styloid process causing proliferation of granulation tissue, which places pressure on the surrounding structures (7); 2) compression of adjacent nerves, the glossopharyngeal, lower branch of the trigeminal, or chorda tympani; 3) degenerative and inflammatory changes in the tendonous portion of the stylohyoid insertion, called insertion tendonitis; 4) irritation of the pharyngeal mucosa by direct compression or post-tonsillectomy scarring (involves cranial nerves V, VII, IX, and X); and 5) impingement of the carotid vessels, producing irritation of the sympathetic nerves in the arterial sheath (3). Treatment of Eagle syndrome is both surgical and nonsurgical. Nonsurgical treatments include reassurance, nonsteroidal anti-inflammatory medications, and steroid injections (1). Surgical treatment is by one of two methods. Otolaryngologist W. Eagle preferentially used a transpharyngeal approach through which the elongated portion of the styloid process was removed (8). Although this technique does avoid external scarring, it has been heavily criticized because of the increased risk of deep space neck infection and poor visualization of the surgical field (must be performed through the mouth) (2, 8). Alternatively, the elongated portion can be removed by an extraoral approach. Although both procedures are effective in removing an elongated styloid process, the extraoral approach is thought to be superior because of the decreased risk of deep space neck infection and better visualization of the surgical field (2, 8). 1 Address reprint requests to Ryan D. Murtagh.